Most of my SBC implementations are including a Citrix XenApp version and you are getting used to settings and behavior of certain features. At one of my latest projects I was implementing a Windows 2008 R2 RD Session Host infrastructure (without Citrix XenApp). This was not the first time I was implementing a Microsoft Terminal Server , but nowadays Microsoft is offering a nice universal printer driver solution and it was the first time for me that I was using the Microsoft universal printer solution called Microsoft Easy Print. As a system administrator you would like to have as less as possible printer drivers installed on your Terminal Servers. In almost all my technical design we make the decision that only one a printer device does not function correctly with the universal driver the possibility exists to install a driver (native or third party) . This driver should be tested thoroughly for possible issues and them implemented by the IT department. Via Citrix policies this behavior can be configured really simple. 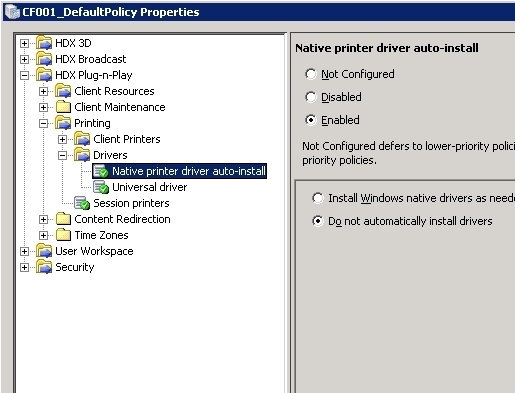 You can specify that the universal printer driver will be used when no native driver is available (as shown in figure 1). This settings will cause that users will install a native driver which is available within the Windows server edition. As mentioned before a System Administrator decides which drivers are available, so you need to configure the setting "Native printer driver auto install" and specify that users "Do not automatically install native drivers". When implementing the Easy Print configuration the configuration is done using Microsoft Group Policy Objects (GPO). By default the Fallback driver (which is the Easy Print driver, the name is still used from earlier Terminal Services releases) is disabled and so when no driver is available the printer won't map in the session. 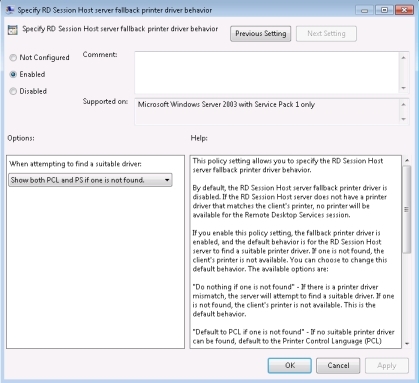 The setting "Specify RD session host server fallback printer driver behavior" enables the Easy Print Driver and you can configure how it should be acting. Just as the Citrix sessions you can configure the behavior that the Easy Print Driver can be used (you can even configure to use PCL and/or PS) if a driver is not available. You think you are configuring that, because after configuring all printer mappings are made with the Easy Print driver. That was not expected, because we configure to use the Easy Print Driver when the native driver is not available. 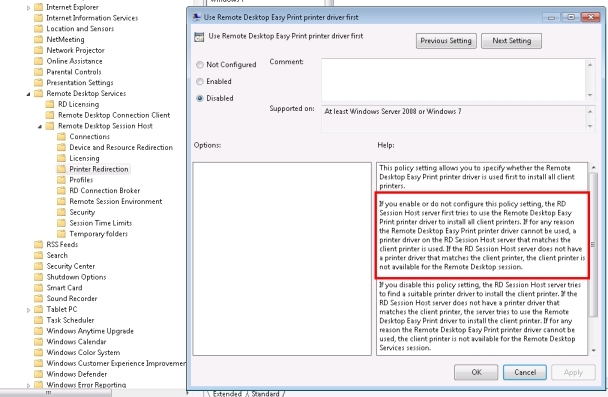 This behavior is caused by the fact that you enable the Easy Print driver, the default behavior is that the Easy Printer driver will be used for all printer mappings even when you configure the "Specify RD session host server fallback printer driver behavior" in the way as shown in Figure 3. A bit strange that a policy that need to be enabled does not give the behavior that you are configuring. Logically there is another setting that has not the most logically name "Use Remote Desktop Easy printer driver first". That's exactly what we won't like to configure, but this is the default behavior Microsoft configured, so we should DISABLE this setting, so the behavior at Specify RD session host server fallback printer driver behavior" becomes active. Unfortunate this will also cause those native drivers will be added automatically when a device is recognized during the printer mapping as shown in Figure 5. Microsoft does not have a setting available to turn off this automatic adding of native drivers by default users. 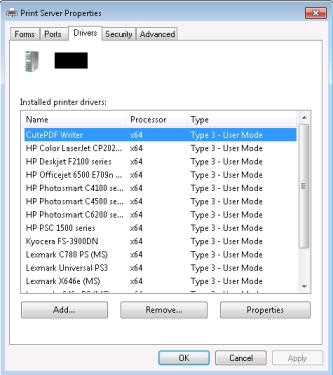 The configuration of the Easy Printer driver behavior is not as clear as Citrix implementation. The "Use Remote Desktop Easy printer driver first" setting has not the most logical name and also the default behavior to use the Easy Printer Driver first is not expected. However with configuration we can almost get the same behavior as Citrix Universal Driver configuration. Unfortunate there is no possibility to disable the automatic native driver installation feature. I really hope Microsoft will add this in a future version, because then their printer solution is as good as Citrix implementation.